Made up of high temper nylon 66 staple, combined by special glue. 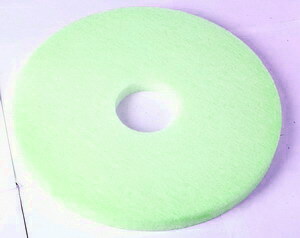 With or without abrasive grains. Owing to the multi layers net with openning structure, they can hold lots of all kinds of polishing agents(liquid, powder etc. ), they have good finishing characters and high effency, and since Nylon 66 has high wearable characters, so their durable character is the best to compare with other material like wool, sisal, cotton etc.. The are use for the decontamination and waxing of ceramic, for renewing of wood floor and funiture, for cleaning and waxing of cars. And for polishing, waxing and finishing of other workpieces. Without hole or different size of holes according customer’s requirements. Usage The are use for the decontamination and waxing of ceramic, for renewing of wood floor and funiture, the cleaning and waxing of cars. And for polishing, waxing and finishing of other workpieces. Feature Owing to the multi layers net structure with openning structure, they can hold all kinds of polishing agents(liquid, powder etc. ), they have good finishing characters and high effency, and since Nylon 66 has high wearable characters, so their durable character is the best to compare with other material like wool, sisal, cotton etc..